The manufacture of sewing machine needles in Middleborough in the decade following 1875 has largely been forgotten. 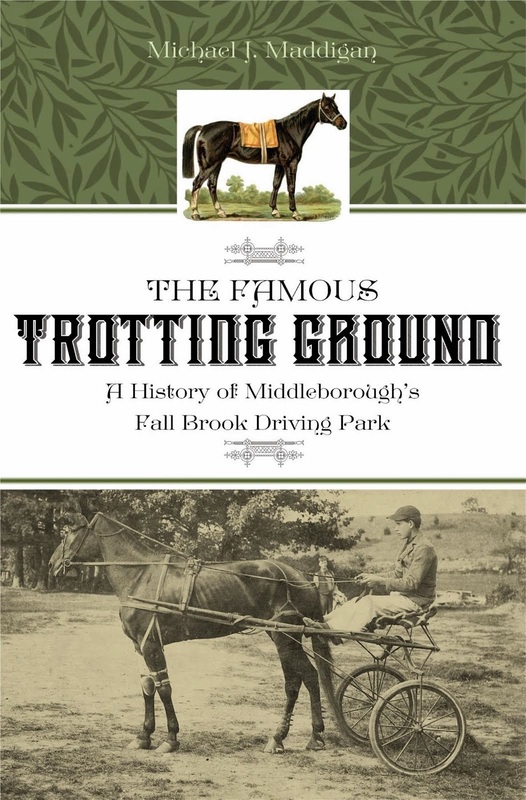 And though the industry was short-lived, it was significant in that it reflected in part Middleborough’s initiative in establishing a diverse industrial base, a development which would help the community weather economic fluctuations better then other communities dominated by a single industry. Middleborough's needle-making industry was established in the form of the Domestic Needle Works on Clifford Street. Established in 1875, the firm marked the successful culmination of an attempt by concerned citizens of the community to lure new business to town, business which was desperately desired given the economic depression at the time. As early as July, 1875, it had been reported that Middleborough was attempting to establish a sewing machine needle manufactory. 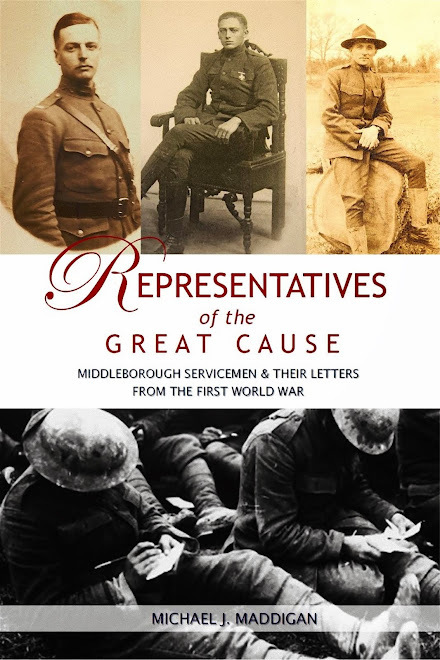 "The people of Middleboro are interesting themselves in a proposition to induce parties to start a needle factory in that town, hoping thereby to furnish employment to a hundred or more persons. The proprietors offer to relinquish the whole control of the business to stockholders, and guarantee a profit of fifteen percent." 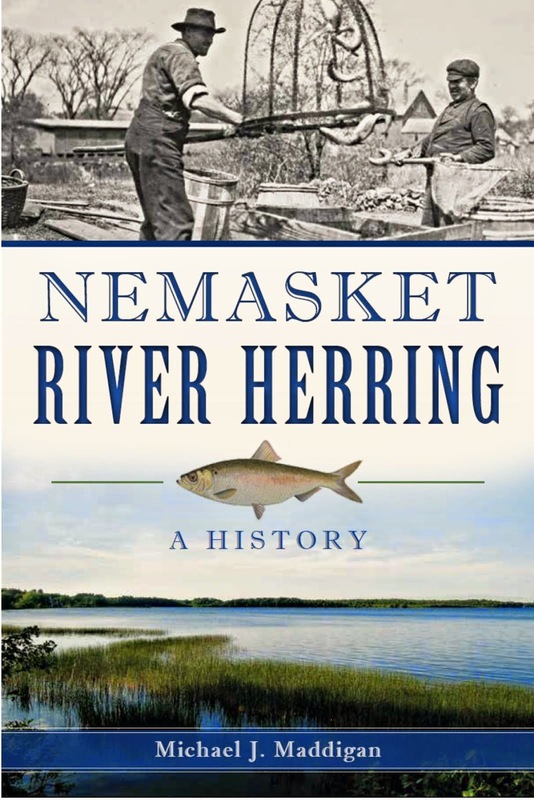 Though efforts to locate a needle works in town encountered a number of difficulties along the way, following a series of community-wide meetings in the early fall of 1875, the final obstacles were cleared and by November the $40,000 required for the venture had been fully subscribed. A board of directors composed of J. Wallace Packard, John B. LeBaron, Dr. Ebenezer W. Drake, Albert Alden, and George L. Soule was named. Packard was the sole non-Middleborough resident among the group, though he was also the only individual among them acquainted with needle-manufacturing. 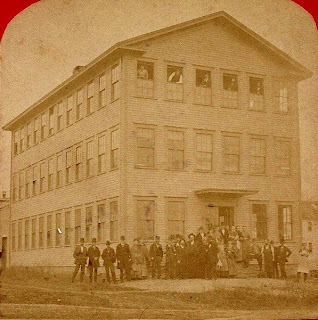 In March, 1858, Packard had begun the manufacture of stitching and sewing machine needles at North Bridgewater (now Brockton), Massachusetts, where the dominance of the shoe industry promoted ancillary industries such as awl and needle-making. Packard probably learned the trade from Charles Howard who had established a needle-making firm at North Bridgewater in 1857, and it was likely Packard who convinced the Middleborough group to establish a needle works. The organization at this time of a number of sewing machine needle companies – including the Domestic Needle Works of Middleborough – marked an attempt by American manufacturers to break the stranglehold of British firms which then monopolized the world market for machine needles, including two-thirds of the American market. Entrepreneurs like Packard and investors like LeBaron, Drake, Alden and Soule no doubt saw financial reward in the opportunity of breaking the British monopoly. Upon its formation, the Domestic Needle Works Company purchased from Philander Washburn an empty lot on the west side of Clifford Street for $800 whereupon a woodframe factory was erected. (The drive-up for the Mayflower Cooperative Bank now occupies the site). The contract for constructing the three-story factory building was given to Joshua Sherman and Jairus H. Shaw of Middleborough, "at a price generally understood as somewhere about $3,000," and the Plymouth Old Colony Memorial marvelled at the fact that the building was to contain over one hundred windows. The needle-making machines were to be driven by steam power produced by a 20 horse-power “New York Safety” engine which was to be housed in a fire-proof engine and boiler room. Steam was carried throughout the building by means of a network of pipes which was installed by Cutts and Jordan, machinists from Taunton. The needle manufactory was reported as nearing completion in late December, 1875, not surprising since the contractors were given a 30-day window in which to complete construction. At this same time, or shortly thereafter, a small “oil house” was constructed at the southwest corner of the property. It was built as a separate facility in order to provide remove the flammable material used in the production of the needles away from the main plant. At the time that the Domestic Needle Works was founded, mechanical production of sewing machine needles was a growing industry. In 1864, Orrin L. Hopson and Herman P. Brooks of Connecticut had developed a machine for compressing steel wire and patented it as “An Improvement in Pointing Wire for Pins”. The machine was promoted as a device which could produce sewing machine needle blanks of superior quality, and it became the foundation of the modern sewing machine needle industry. Needles at the Domestic Needle Works were produced by the cold swaging or cold forging method wherein room temperature steel wire was compressed between a series of metal dies. The process of needle manufacturing at the time was described in 1886 by George Bleloch who left a carefully documented record of the process as conducted by the National Needle Company of Springfield, Massachusetts. It is likely that a very similar process, though on a smaller scale, was followed on Clifford Street. The wire is drawn of suitable size for the shanks or but end of machine needles, and is received at the needle factory in coils weighing about 50 pounds each. The coil is placed on a reel, and fed through one of the straightening and cutting machines, four of which are in constant use. These machines are automatic, and deliver the wire, cut into uniform lengths, each piece containing sufficient stock for the needle which is to be made from it. The ends of the small pieces of wire being rough, they are next placed in the hopper of the butting machine, and are carried between two highly-speeded emery wheels, and come through with the ends ground to a conical shape, thus finishing one end, which is to be the shank, the part of the n that is held in the needle-bar of the sewing-machine, and preparing the other end to enter the dies of the compressing or swaging machines which perform the next important operation. The compressing machine is a triumph of inventive genius and mechanical skill, and is purely automatic. It reduces the wire, by means of rapidly vibrating dies, to the size for the blade of the needle; the same operation elongating it to the length required for a needle-blank. Twenty-five of these compressing-machines are in use, each one having a capacity for swaging 3,000 [needle]-blanks a day. Twenty-five pairs of dies, each pair coming in contact 4,000 times a minute, create a din that reconciles one to investigate in less-noisy quarters. We will, therefore, follow the blanks from the compressing-room to the pointing department, for soft-pointing, so-called to distinguish it from the finish-pointing that is done after the needles are tempered. The self-pointing is performed automatically by means of an ingenious machine that takes the blanks from a magazine, clips them to a uniform length, and carries them across the face of an emery wheel, shaping the points, but not making them sharp, as sharp points would be injured in passing through succeeding operations. Grooving follows soft-pointing, and is an operation requiring precise yet strong machinery, susceptible of the finest adjustment. The n when grooved is held in a clamp between two parallel spindles, on the end of which are fine steel saws or cutters. The clamp is fastened to a sliding bed, and grips the n as it carries it between and in contact with the cutters. One groove is short; the opposite one is cut the full length of the n-blade, and is intended to hold and protect the thread while the n passes through the fabric in sewing. The grooving-machines are partly automatic, one person being able to attend three machines. The eye-punching is next in order -- a delicate operation, bringing into play mechanical skill, and requiring nimble fingers. It is performed by young men of from 16 to 24 years of age, the most expert being able to punch 16,000 eyes a day. The needles are now ready to be stamped, which is done by an automatic machine which rolls the n over the face of steel type with sufficient pressure to impress the name and size on the shank. Most modern sewing-machines use self-setting needles, and this feature is secured in different ways; some needles are notched at the end of the shank, others have the shanks slabbed or ground off on one side, while some have a groove cut through the shanks. These devices prevent the needle entering the needle-bar of the sewing-machine in any but the correct position. Ingenious machines are used in each of these operations. Notching and grooving the shank precede tempering; slabbing is subsequently done with emery wheels. Sixty per cent of the total cost of making a needle is expended in material and labor before it is ready for hardening and tempering; and a mistake in either of these operations is not only vexations, but expensive. The finest grade of steel is a sensitive and capricious metal, and requires the most delicate and patient treatment in bringing it to a tough and elastic temper. In the process of hardening, the needles are submitted to the blaze of a charcoal fire until they are heated to a cherry-red color, and they are then chilled in an oil bath. When taken from the oil, they are washed in hot water charged with sal-soda, to remove the oil, and are then ready for tempering, which is done by again heating, this time in an oven heated to about 500 degrees, where the needles do not come into direct contact with the fire. If all these operations have been successful, the needles are now as though and elastic as a Damascus blade; and the series of polishing operations which follow are intended to bring them to a high finish, especially the eyes and points. The first of the polishing operations is called brass-brushing, and the needles are prepared for it by being fastened in clamps; the blades and grooves are exposed to the action of a brush made of fine brass wire, and revolving 6,000 times per minute. A paste of fine emery and oil is used with the brush, and a high polish and smooth surface is the result. Without being released from the clamps the needles are taken to the threading-room, where girls 15 to 18 years of age thread each needle with half a yard of best Sea Island cotton, the size of the thread corresponding to the size of the needle. They are now ready for the eye polishers, who stretch the threads on a frame, and draw them as tightly as the strings of a harp. Oil and fine emery are freely applied; and the clamp, full of needles, is drawn rapidly back and forth on the threads, until by a keen sense of feeling the operator knows the eyes to be smoothly polished. The needles are again polished, but this time on a brush made of horse-hair, after which they are sent to the inspecting-room, where every needle is closely examined, and all imperfect ones condemned and destroyed. This close special inspection is maintained to correct any oversight on the part of the inspectors stationed in each department of the factory to scrutinize the needles as they pass through the various operations. The most expensive of all operations in needle-making, straightening, following the inspection. Hardening and tempering spring the needle more or less out of true; and, as straightness is an indispensable quality for a perfect needle, the greatest care and watchfulness are exercised in this department. A steady hand, a correct eye, good judgment, and strong nerves, are the requisites of a successful needle-straightener, and not more than one person in 20 can learn the art; but, once learned, the man or woman who has mastered it is sure of steady employment and good pay. Each needle is rolled on a block with the index finger on one hand of the operator, while the crooks and bends are hammered on with a light bronze mallet wielded by the other. After the straightening operation the needles are again inspected, to make sure they are straight, and are then passed on to the finish-pointer. This operation is done entirely by hand, and requires great skill and care to make the points of uniform length and graceful taper. The workman rolls from 15 to 20 needles between the forefinger of the left hand and the thumb of his right, at the same time applying the point to a fine emery wheel or belt under rapid motion. The touch of the operator must be as light and delicate as a fairy's footstep, so easily is the temper drawn from the extreme points when they come in contact with the grinding surface. The next operator handles the needles in the same manner as the finish-pointer, and presses the points lightly on the surface of a revolving buffing-belt made of the finest material, and having the qualities of a fine razor strop; this gives the points a brilliant finish, and sets them for use. The next process is the finishing one; the needles are placed in wide-jawed tongs holding 50 or more needles, and are polished on a fine and rapidly-revolving brush charged with crocus mixed in alcohol. From the last brusher the needles are sent to the stock and shipping room, where they are put up in packages of various kinds and sizes, for transportation to all civilized and semi-civilized lands. The successful prosecution of an enterprise of this peculiar character requires not only inventive skill, but suitable appliances at the command of a corps of expert tool-makers, with trained eyes and cunning hands, to work into form the new inventions in automatic machinery which contribute so much to the success of this company. The [machine]-shop, or tool-room, is complete in its equipment and appointments. Needle manufacture by the Domestic Needle Works commenced early in the year in 1876 and during the autumn of that year production was planned at 25,000 needles per day. Though this level of production does not seem to have been reached, business was brisk enough to warrant an addition to the factory building that same fall. Additionally, the business had succeeded in attracting new families to town. 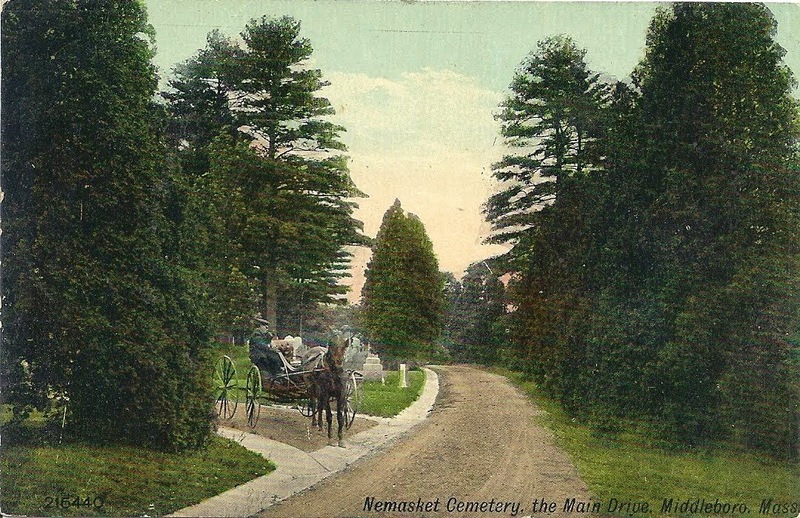 The Old Colony Memorial reported in January, 1876, that the prospect of needle making had attracted eight families to Middleborough in mid-January alone. In 1877, it was reported that the company employed about fifty hands and produced 12,000 needles daily. In August of that year, the company began shipping 15,000 of these needles monthly to markets in Australia. Business continued to prosper throughout 1878: "The Needle Works at Middleboro are reported as receiving large orders, and all hands are busy." 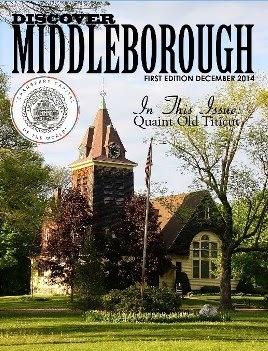 In April, the plant was operating ten hours a day, leading the Middleboro Gazette to surmise that “probably orders are increasing”. Nonetheless, the plant was idle at the end of the year, though possibly for stock-taking purposes rather than lack of business. By fall, 1879, the company had been able to increase production to a level between 15,000 and 17,000 needles per day, most of which were shipped west. The needles were packed 5,000 to a box for shipping. Production appears to have been maintained continuously with no shutdowns, save for those which purposely idled the plant for stock taking, such as that recorded in November, 1879. 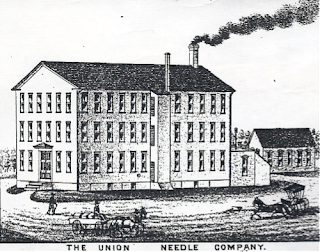 During the year ending in November, 1879, the plant manufactured some three million needles, and represented $18,000 worth in wages paid out during the course of the year, prompting the Old Colony Memorial to report that “the affairs of the concern are represented as in a prosperous condition.” (In comparison, one of the nation’s larger needle manufacturers, the Howard Needle Company at Brockton, Massachusetts, had produced some 7.2 million needles that same year). Yet despite the seeming success of the firm, financial circumstances took a drastic turn for the worst in late 1879 or early 1880. "The stockholders of the Middleboro Domestic Needle Works, after running a year, find their property now worth one eighth what it was when they invested in it." The Middleboro Gazette reported in the fall of 1880 that the "stock in the domestic Needle Works is pretty well down. Five hundred dollars worth, at original cost, sold for one and a quarter cents." In the absence of financial records for the company, we may only speculate as to the causes of this disastrous financial turn. With the value of the company at rock bottom, it was reorganized as the Union Needle Company which acquired the Domestic Needle Works’ plant and property in early October, 1880. The Union Needle Company had first been founded in Connecticut in 1858, making it one of the nation's oldest needle manufacturers, and this date was featured on the company's logo which included an eagle clasping a needle in its beak. 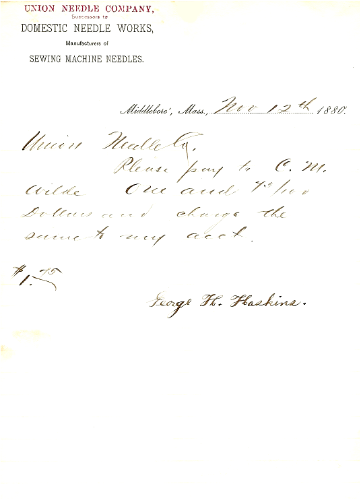 While the role of the Connecticut company in the reorganization of the Domestic Needle Works is clouded, Albert Alden of the latter company was named as the president of the re-organized Union Needle Company in 1880, though responsibility for the day to day operation appears to have been vested in Millard F. Blaine who acted as the manager. Born in 1849, Blaine was an 1879 graduate of the University of Michigan Law School, and practiced in Rockford, Illinois, before coming to Middleborough where he was hired as the manager of the Union Needle Company in 1880. It is not clear what experience, if any, Blaine had in the field of needle-manufacturing. Regardless, the needle works revived under Blaine’s management and the superintendence of George Holbrook. “The needle factory at Middleboro turns out 20,000 needles per day, the production last year according to the News exceeding that of the previous one by 100,250,000. A new machine for forming the blanks has just been placed in the factory which will greatly facilitate the manufacture.” For the subsequent two years, the firm prospered, continually running at a profit. In order to secure its profitability, in March, 1883, the Union Needle Company entered into an agreement with a number of other American sewing machine needle manufacturers including the Charles T. Howard Company of Brockton, Massachusetts; I. T. & F. D. Smith, Mount Carmel, Connecticut; A. H. Smith, New Haven, Connecticut; National Needle Company, Springfield, Massachusetts; Waterbury Needle Company, Waterbury, Connecticut; and Excelsior Needle Company, Torrington, Connecticut. 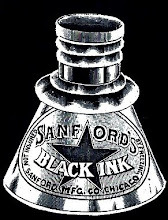 The associated firms established the Central Needle Company and included Millard S. Blaine of the Union Needle Company among its Directors. Ostensibly, “this company was organized … for the purpose of manufacturing sewing machine needles and supplies. Its capital stock was placed at $10,000, and it was soon taken up by a syndicate” composed of the previously mentioned firms. It was later charged that the syndicate, in fact, was an illegal conspiracy in restraint of commerce, seeking to establish a monopoly over the production of sewing machine needles and sewing machine supplies. 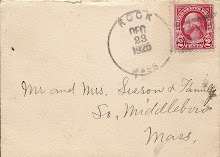 In 1885 it was revealed that the Central Needle Company’s “first act was to buy up all opposition needle companies and divide their plants up, thus preventing competition.” As part of this process, the Porter Company of Watertown, Massachusetts, a manufacturer of needles, had been acquired and its machinery disassembled, shipped to Middleborough, and re-installed in the Clifford Street plant where it was expected to increase the Union Needle Company’s production by some fifty percent. The royalty was $1 on each thousand needles manufactured and sold and a proportionate amount on all other supplies. Each firm was obliged to admit an agent of the Central Company monthly, who examined the books and accounts and obtained full statements, and prices obtained. From these reports the Central Company dictated the goods to be manufactured by each firm, fixed prices, and determined what parties, if any, had forfeited the right to receive goods at the lowest prices. If any firm was found to have violated the agreement into which all entered, or to have sold, directly or indirectly, for prices less than the sums authorized, it was fined $1,000. Every month the firms turned over their royalties to headquarters, where the proceeds were distributed in dividends to the stockholders. By the ironclad agreement entered into by all no firm was permitted to sell, transfer, or lease, or in any manner dispose of, any plant or part thereof, or loan or allow any outside party to use the same or sell any patent or interest therein to dispose of any shop rights. In return the company protected its patrons from any competition, secured for them the highest prices that the public would stand, and agreed to crush any new manufactory that should attempt to start. Continued financial success, however, would prove illusory, and the questionable control exercised by the Central Needle Company over the market would come under scrutiny within the year. Alvord, through his attorneys Hastings & Southworth, brought suit against the Central Needle Company, alleging that it had violated the terms of its charter and had acted in restraint of trade. Alvord’s application, however, was denied on a number of grounds, including the fact that it was not clear that the Central Needle Company had acted illegally and that Alvord was a party to the original acts of the company which he now sought to sue. Further it was alleged that Alvord had been motivated to bring legal suit against the company merely because it was injurious to another company (the Excelsior Needle Company) in which he held a greater interest. Not surprisingly, Alvord’s suit was dismissed. Adding to the Union Needle Company’s woes at this time was its naming as the defendant in a patent infringement suit brought by the Excelsior Needle Company of Torrington, Connecticut, before the U. S. Circuit Court in New York City. Ironically Excelsior, which was asking $10,000 in damages, was one of Union’s partners in the Central Needle syndicate. Excelsior alleged that the Union Company was employing patented Hopson and Brooks machines to produce sewing machine needles. In 1866, Hopson and Brooks had relinquished the patent rights to their machine to the newly organized Excelsior Needle Company which included Charles Alvord as secretary and treasurer. The vacant plant was suggested for other manufactures including tacks and tricycles, but remained unoccupied until 1890 when it was sold and occupied by the W. H. Schlueter box company. By late 1884, Blaine had removed to Geneva, New York, where he was manager of the Kirkwood Hotel. In 1904, when owned by Alden, Walker & Wilde, shoe manufacturers, the former plant burned down. Ironically, though, the Domestic Needle Works allegedly was not historically the first manufacturer of needles in Middleborough. 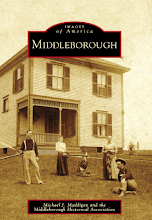 At the time of the Needle Works' establishment in 1875, the Old Colony Memorial reported that "Middleboro' people find that after all they are progressing backwards. The rejoicing over the establishment of a needle factory brings out the fact that needles, equal in finish in every respect, were manufactured in that town long ago." This photograph taken from a stereographic card published in the late 19th century depicts the Domestic Needle Works manufactory on Clifford Street as viewed from the southwest. While the date of the photograph is unknown, the view is believed to depict operatives of wither the Domestic Needle Works or the Union Needle Company. 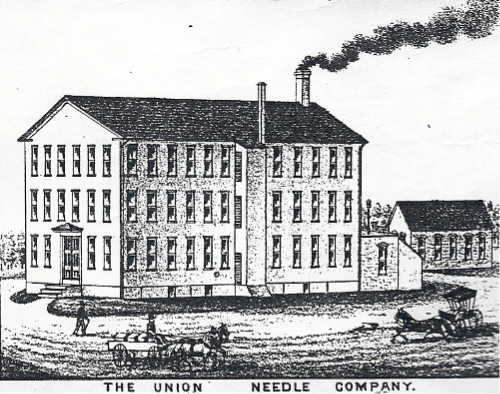 By late 1880, the Domestic Needle Works had been reorganized as the Union Needle Company, a business development indicated by the overstamping of the former Needle Works' billhead as seen on this November 12, 1880, statement. Union Needle Company, detail from "Middleborough, Mass., 1881", Milwaukee, WI: Beck & Paull, Lithographers, 1881. This view depicts the needle manufactory, then operated by the Union Needle Company, from the northeast. The brick engine room is seen on the rear of the manufactory, while the building's water closets were contained in the small ell protruding from the north wall. Presumably what is the "oil house" is seen at the far right. The manufactory's large number of windows at which the Old Colony Memorial marvelled is clearly indicated. The elaborate billhead used by the Union Needle Company in 1881 and after displays the company logo with the dates of establishment and reorganization, as well as the trademark bald eagle clasping a needle in its beak. 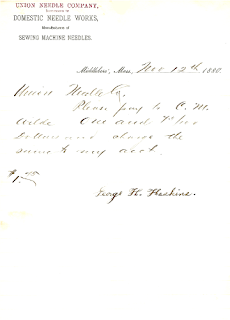 This pay receipt dated January 10, 1882, is for $11.94 and is made out to Martina Callan. The needle industry in Middleborough employed women and girls in a number of capacities, including finish work. Miss Callan was the daughter of Luke Callan and lived in the house on Clifford Street next door to the needle works. At the time the receipt was dated she was 12 years old. Middleboro Gazette, “What the Gazette Was Saying Fifty Years Ago”, October 30, 1925, p. 6; ibid., November 13, 1925, p. 7; ibid., November 27, 1925, p. 6; ibid., December 25, 1925, p. 3; ibid., November 5, 1926, p. 6; ibid., December 3, 1926, p. 6; ibid., November 25, 1927, p. 9; ibid., April 13, 1928, p. 7; ibid., October 12, 1928, p. 8; ibid., November 16, 1928, p. 7; ibid., December 14, 1928, p. 9; ibid., December 21, 1928, p. 6; ibid., October 11, 1929, p. 8; ibid., October 25, 1929, p. 4; ibid., November 22, 1929, p. 8; “What the Gazette Was Saying Fifty Five Years Ago”, November 7, 1930, p. 6; ibid., November 21, 1930, p. 8; ibid., January 2, 1931, p. 6; ibid., March 27, 1931, p. 9; ibid., October 30, 1931, p. 6; and ibid., November 20, 1931, p. 7. “Middleboro, Mass.” New York: The Sanborn Map & Publishing Co. Limited, August 1885. 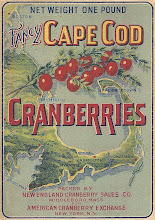 “Middleboro Plymouth Co. Mass.” New York: Sanborn-Perris Map Co., Limited, May 1891. New York Times, “Monopolists Fall Out”, June 14, 1885, and “The Central Needle Company”, July 7, 1885. Old Colony Memorial, “County and Elsewhere”, August 5, 1875, p. 4; ibid., October 14, 1875, p. 4; “Middleboro’”, November 25, 1875, p. 4; ibid., December 9, 1875, p. 4; “County and Elsewhere”, December 23, 1875, p. 4; “Middleboro’”, January 20, 1876, p. 5; “County and Elsewhere”, August 24, 1876, p. 4; ibid., November 30, 1876, p. 4; ibid., August 2, 1877, p. 4; ibid., December 27, 1877, p. 4; ibid., August 8, 1878, p. 4; ibid., October 30, 1879, p. 5; ibid., November 6, 1879, p. 5; ibid., November 27, 1879, p. 5; December 18, 1879, p. 4; ibid., January 29, 1880, p. 4; ibid., April 8, 1880, p. 4; ibid., June 3, 1880, p. 4; ibid., September 16, 1880, p. 4; ibid., January 11, 1883, p. 4; ibid., February 1, 1883, p. 4; ibid., March 29, 1883, p. 1; ibid., April 12, 1883, p. 4; ibid., August 9, 1883, p. 4; ibid., August 16, 1883, p. 4; ibid., December 6, 1883, p. 4; ibid., March 27, 1884, p. 4; ibid., April 7, 1884, p. 4; ibid., May 1, 1885, p. 5; ibid., August 14, 1884, p. 4; ibid., August 21, 1884, p. 4.
www.fundinguniverse.com/company-histories/The-Torrington-Company-Company-History.html [The Torrington Company was the successor firm to the Excelsior Needle Company of Torrington, Connecticut]. 32 Fed. Rep. 221 [Excelsior Needle Co. v. Union Needle Co., United States Circuit Court, Southern District of New York, February 23, 1885].